Aesop was a Greek storyteller born in approximately 620 BCE. Tradition says he was born as a slave, but developed a real talent for fables that were used to teach truths in a simple, understandable way. While Aesop was revered for his abilities, it is almost certain that many of the fables attributed to him were actually written by countless people over the ages. The fame garnered by Aesop is such that some scholars question whether he was a real person at all. (Presumably, a slave in ancient Greece would have been hard-pressed to attain the fame that Aesop did.) Be that as it may, Aesop is referred to by ancient luminaries such as Aristotle, Herodotus, and Plutarch. His fables (or those attributed to him) have been translated around the world and are the substance of numerous stories, poems, and children's books. 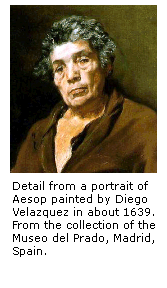 More information about Aesop and his life can be found at the Wikipedia page devoted to him. There are currently 258 fables on our site. To discover the breadth of Aesop's fables, pick one of the categories at the left. You can also view a random fable, if desired. If you know of a fable we have missed, drop us a line and let us know.